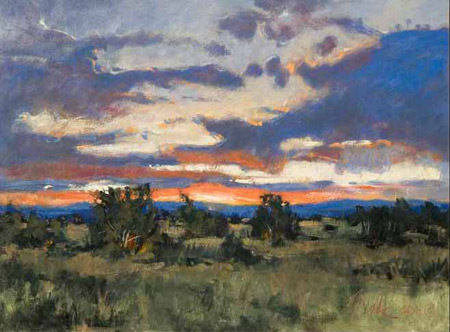 In the worlds that George Pate creates on canvas, one can feel the air and hear the stillness. One is drawn into these worlds traveling down snowy trails or winding roads, and the inclination is to linger there in a place of silent beauty. 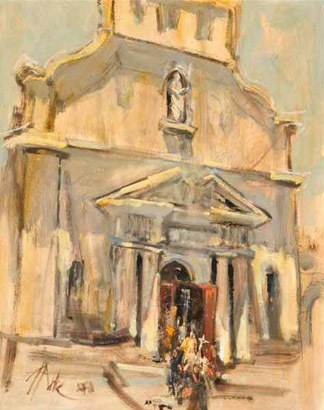 Natural and architectural forms fill George Pate’s work, reflecting the major preoccupations of his life. 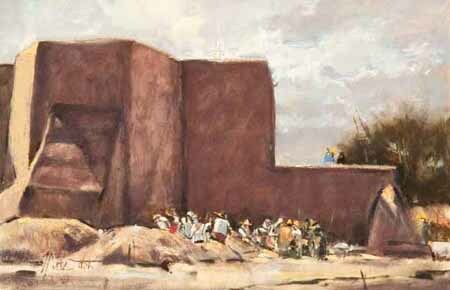 Graduated as an architect, Pate retains his love of dwellings and their shapes and forms. 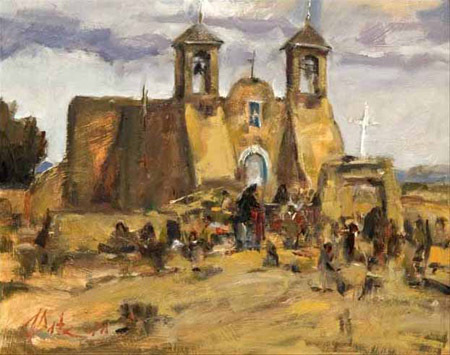 Whether a rambling, flat-topped adobe complex or a tall- spired New England church, the buildings of various cultures provide destinations in his works. 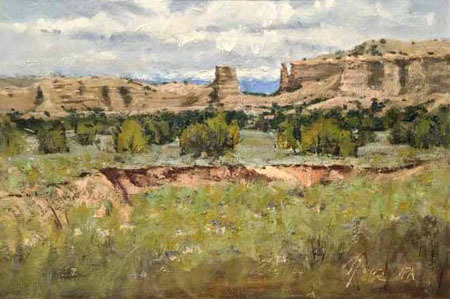 Pate’s affinity for landscape stems from or, conversely, has motivated his many travels throughout the United States, Japan, Canada, Mexico and Europe. 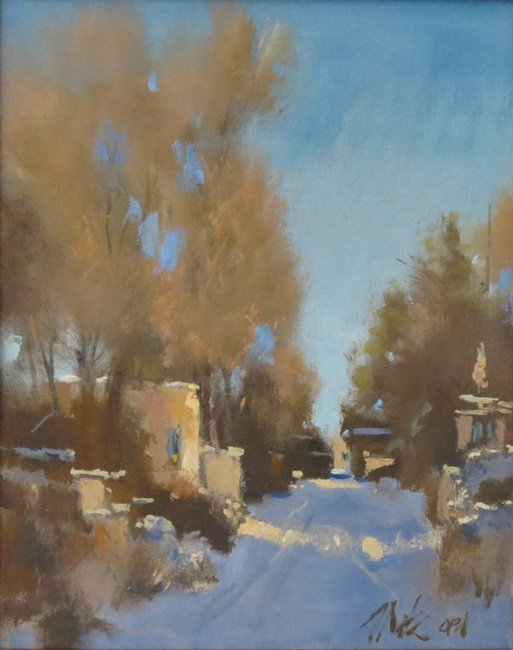 A resident of Santa Fe, New Mexico since 1977, Pate finds ample subject matter in this imminently paintable landscape, filled with historical architecture and the manifestations of distinctly different cultures. 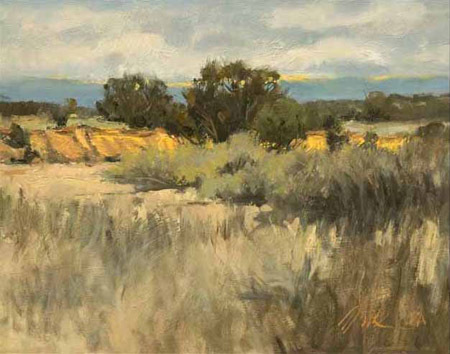 He works en plein air to render New Mexico’s light, shade, and shadow with strong design, vital color, and thoughtful brush strokes. 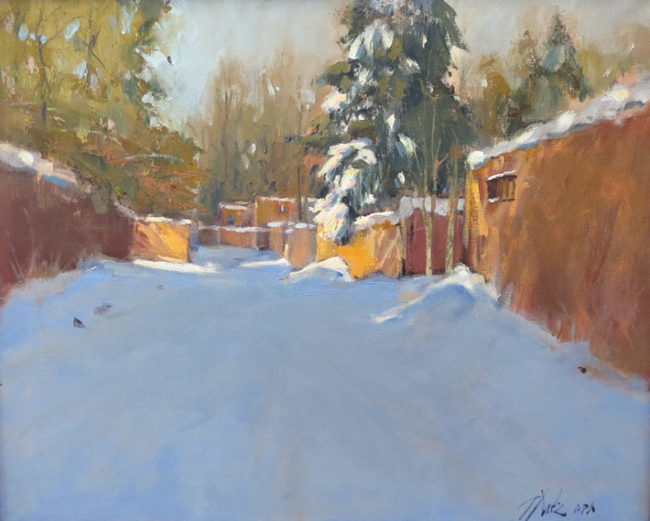 Pate evokes both realism and impressionism in his canvases and consistently displays his understanding of the essentials of form, color, and composition. 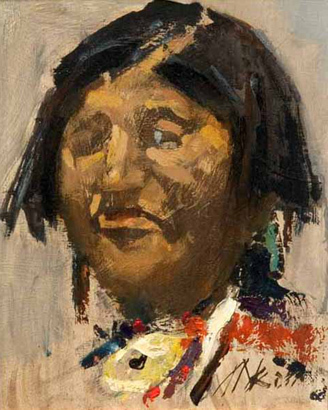 At the same time, his works are inventive and infused with emotion. 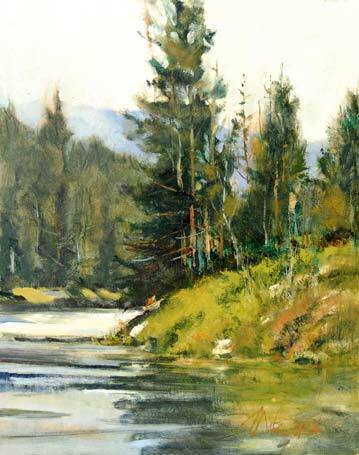 A native of Detroit, Michigan, George Pate spent summers on his uncle’s farm in Canada. 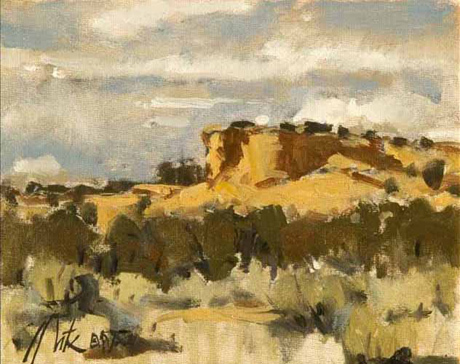 His long journey as a painter began at age two when he received his first easel. While in the Air Force, he traveled to Japan and the Pacific. 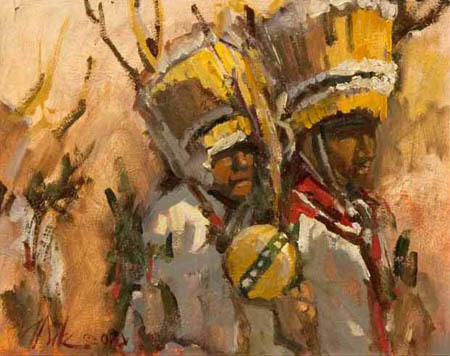 A born teacher, he makes his knowledge of painting available to students at the university level and leads innumerable painting workshops. 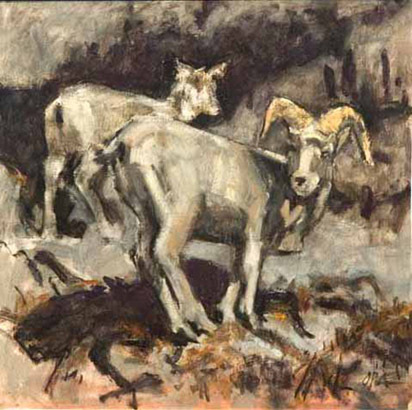 Professional organizations have recognized Pate with shows, purchases, and awards. 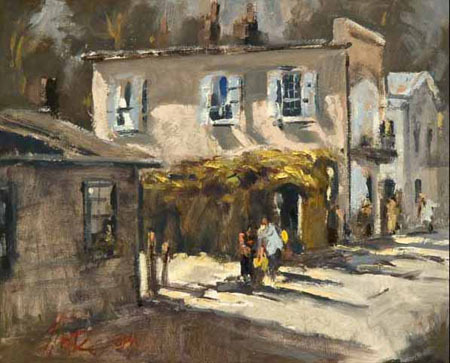 His work is represented in both private and corporate collections. 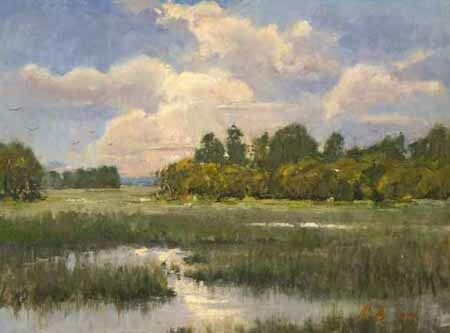 While a member of the Salmagundi Club in New York, he broadened his work to include the East Coast and Southeastern landscapes. 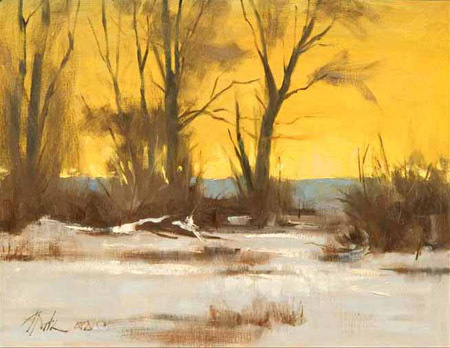 George Pate fully inhabits each landscape he paints, extracting the essence that resides in the soul of the land, and releasing its poetry onto the surface of his canvas.